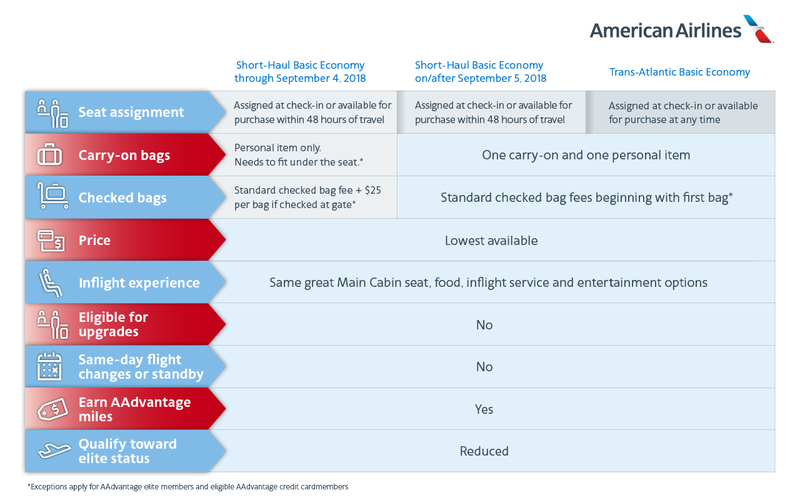 Newsroom - Basic Economy Fares Will Soon Be More Attractive - American Airlines Group, Inc.
Today, American Airlines announced that beginning Sept. 5, Basic Economy fares will include both a personal item and a carry-on bag like other Main Cabin fares. Basic Economy is working well in the markets where we offer it today. Customers benefit from our lowest fares that are competitive with no-frills carriers while experiencing American’s unparalleled network, better product and great customer service. Removing the carry-on bag restriction will make our short-haul Basic Economy fares more competitive with airlines that include a carry-on bag in their lowest fares. Until Sept. 5, current Basic Economy fare rules will continue to apply, including the allowance for only one personal item and the gate service fee when a Basic Economy customer checks a carry-on bag at the gate.